"Some Insight on the Saddle Making Process" with John Willemsma & Carlos Macias. 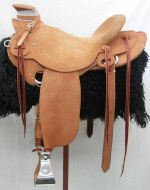 I teamed up with Carlos Macias (of BuckarooGear.com) and we compiled these videos while Carlos was at my shop in building his first saddle.. These videos were intended to give our customers or anybody looking to purchase a new saddle a different prospective on the saddle making process.. Disscusions and point of veiw from Carlos as a first time saddle maker. Hope you Enjoy..